The purpose of Universal Design is to increase people’s opportunities to participate in society through the design of products, services, methods of communication, buildings and built-up spaces that are accessible to as many as possible. Many will suffer from some form of disability at some time in life, either temporarily or long-term. Disability is best viewed as yet another aspect of the diversity of humankind. By applying the principles of Universal Design to shared spaces and media, it is possible to create general solutions that cater to many, while avoiding the need to implement special solutions for various groups. The terminology of Universal Design is not limited to building or architecture, but is equally important in sectors such as education, information, design, et cetera (Rogaland County Authority 2014). The implementation of Universal Design in the heritage sector requires willingness to find good compromises that make the project feasible. Ideally, the consultant should have experience from, insight into and respect for both Universal Design and cultural heritage protection, in addition to formal training as an architect or construction engineer, ensuring cross-disciplinary expertise, to ensure sustainable solutions and compromises. The mainstays of Universal Design are human dignity, respect for the individual and protection against discrimination. The United Nations Convention on the Rights of Persons with Disabilities, established in 2006, aims to prevent discrimination of people with disabilities and has played an important role in highlighting equality, participation and self-determination. The Convention has proven to be a powerful tool to ensure respect for the civil, political, economic, social and cultural rights of people with disabilities. Demographic forecasts show that the age group 67+ will have increased by 80% by 2030. (Rogaland County Authority 2014, 11 b) This is a strong reminder of the importance of prioritising ongoing awareness and potential solutions to accessibility within everyday life. Each and every one of us wishes to stay in control of our own lives, participating actively within our societies. In order to achieve this, we must develop an inclusive society together, applying a long-term perspective. This responsibility rests equally with the public and private sectors. Rogaland County Authority is well underway in this mission, but achieving the objectives set out in the plan requires a substantial and sustained effort. The design applications have, to a large extent, followed up the County Plan for Universal Design, taking its cue from the plan’s six focus areas and the pilot county project. Efforts are being made to develop expertise and thereby contribute knowledge and understanding of what Universal Design means for the individual, for the municipalities and other stakeholders. The Authority is also implementing measures to improve people’s access to their physical surroundings. The County Plan sets the course for municipal and state planning and serves to define the county authority’s commitment in its work. The principle of sector responsibility forms the basis for the follow-up of the plan, meaning that each individual public body is responsible for universal design within its field of expertise. This emphasises the importance of inter-agency collaboration in the field of Universal Design. The County Plan for Universal Design was passed unanimously by the County Assembly in March 2007, followed by the approval of the Ministry of the Climate and Environment in autumn the same year. The County Assembly also adopted a motion to present an application for Rogaland to be given status as a pioneer county for the implementation of Universal Design. This motion formed the basis for Rogaland County Authority’s application to become a pilot scheme, upon the invitation of the Ministry of Climate and Environment in January 2009. Rogaland County Authority was selected to become one of eight pilot counties in Norway in May 2009, in accordance with Measure K1 of the Government’s 2009-2013 Action Plan for Universal Design. This action plan would form the basis for the development of universal design as a strategy in all municipal and county planning and administrative management. The measure covered resource municipalities, pilot counties and new pilot municipalities. Training courses aimed at builders and craftspersons. Each example ties in with an area of expertise and says something about the processes that went into the final result, and which methods the municipalities and county believe have been successful. Many of the examples reach across multiple sectors and can be categorised under several technical areas of expertise. The county initiative ‘City of Culture for All’ was inspired by Stavangerand Sandnes, which were awarded joint status as the 2008 European Capital of Culture. The project’s objective was to study the venues of the Capital of Culture events and to what extent they were accessible to all, based on universal design principles. The results were published on www.tilgjengelighet.no, (tilgjengelighet means accessibility in Norwegian). The user organisations welcomed this initiative and reported that the need for such a website was substantial. This website is a useful information channel for the general public about accessibility to various locations in the county. It also serves as a marketing channel through which the county authority can issue information about ongoing Universal Design measures (Rogaland County Authority 2014). In addition to cultural venues, the website also covers tourism (hotels, restaurants, attractions, cultural heritage sites and outdoor recreation areas), public buildings, secondary schools, sports venues and different types of outdoor areas. The website is currently only available in Norwegian, but work is underway to establish an English version. 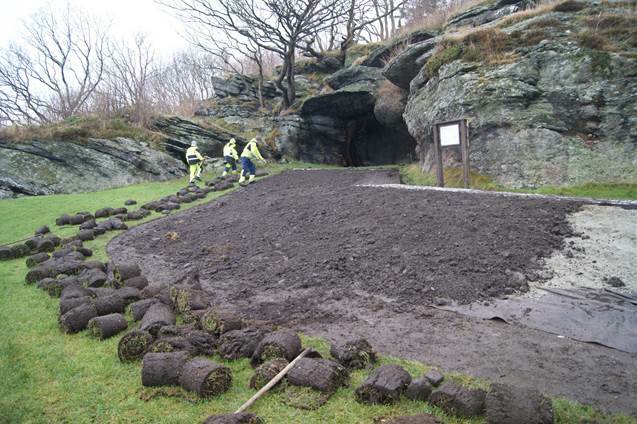 Increased accessibility to the Stone Age site of Vistehola Cave is one of the specific outcomes of the joint efforts made possible by the pilot scheme funding from the Ministry of Climate and Environment and the County. 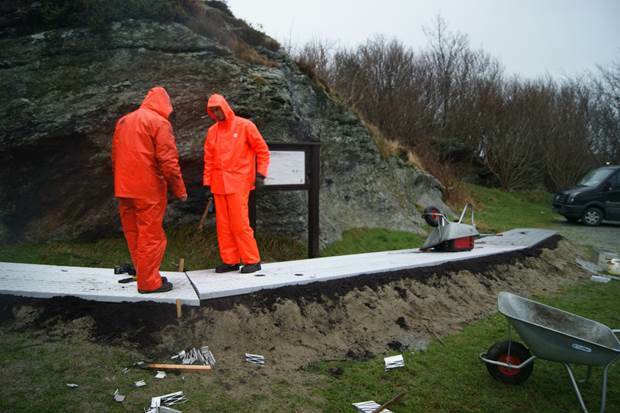 The county contributed 70% of the funding and the remainder was provided by Rogaland County Council (Rogaland County Authority 2013). The primary objective for Universal Design is ensuring an equal degree of access for all, which applies to outdoor areas and cultural heritage sites.However, the application of Universal Design to such heritage sites will always entail compromises. 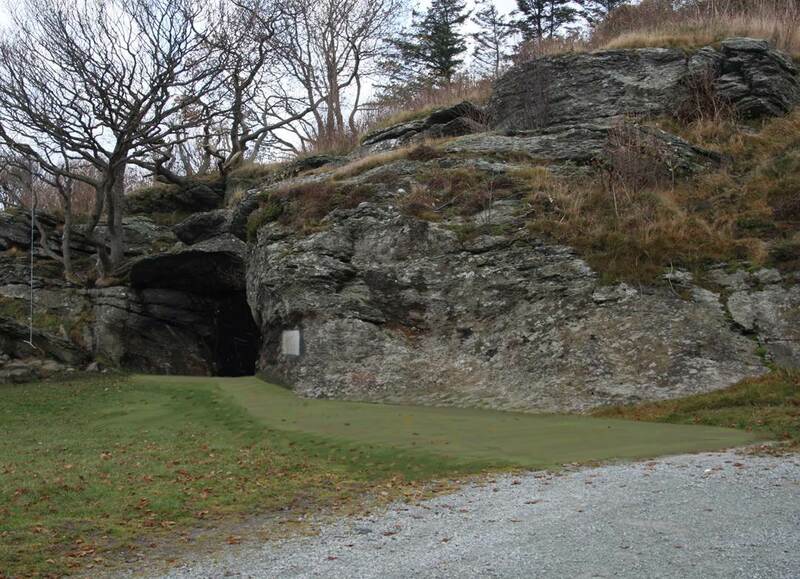 Vistehola Cave is one of the most famous prehistoric sites in Rogaland, and perhaps all of Norway. A series of important discoveries of ancient bone and antler artefacts have proved the site is of major archaeological interest. Such artefacts are specific to the region, and of considerable rarity as are the Mesolithic bone and shell middens present at the site (Rogaland County Authority 2013, 5). Vistehola Cave has provided us with some of the most important insights into the diet of the Mesolithic period. 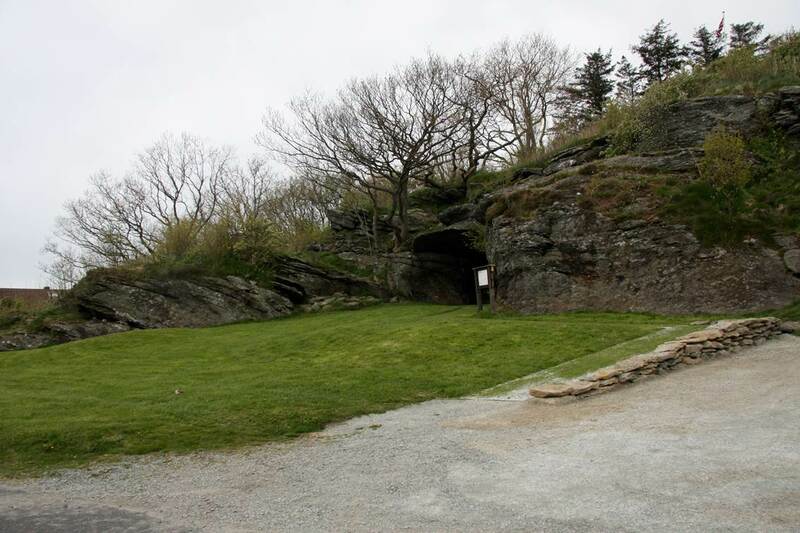 To crown it all, in the middle of the cave is the funeral site of the so-called Viste Boy. 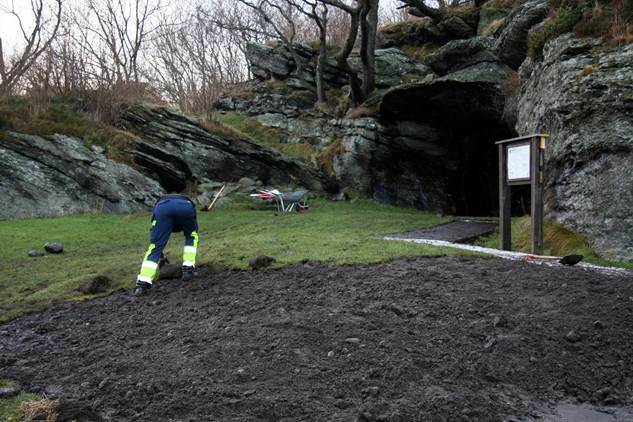 He represents one of very few human remains ever found from this early period of Norwegian prehistory. The area has not been completely excavated yet, and there may be important archaeological discoveries still in the ground. Another important aspect of Vistehola Cave is that, unlike many sites of the period, it offers an understandable connection to the deep past. 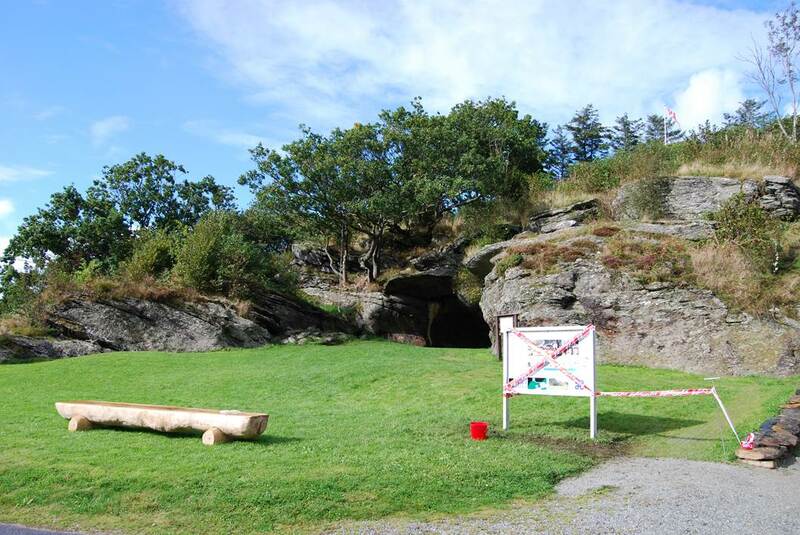 The cave was the dwelling of prehistoric people, and it is easy to envision the connection between habitation and surrounding landscape, as the beach is just 20–30 metres from the cave entrance. 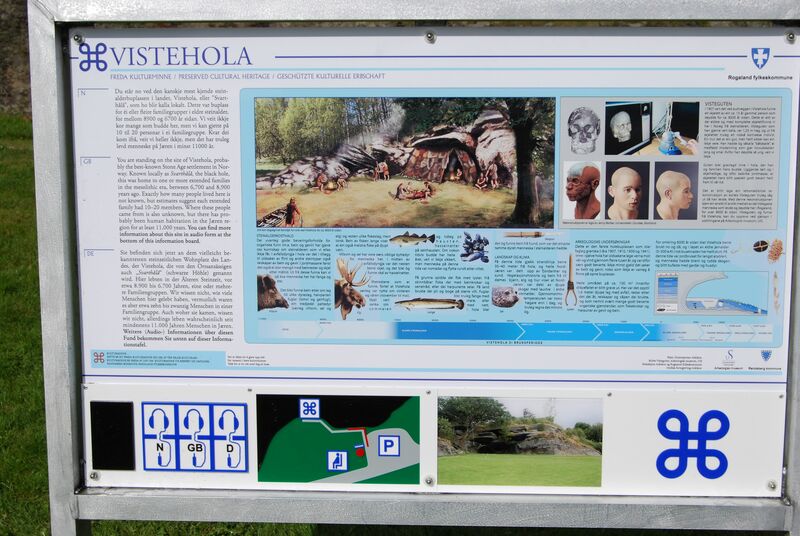 To maintain that special narrative, it has been considered vital to avoid modifications which would rob the public of the opportunity to view and reflect on life at Vistehola Cave during the Mesolithic and Neolithic periods. The site itself required substantial measures to develop Universally Designed access such as a firm, even and nonslip surface, able to withstand heavy rains, frost and frost heave, along with a maximum ascent/descent gradient of 1:15. However, the site also requires protection, with no digging permitted below the turf to avoid damage to stratigraphic layers. Any possible solution devised had to be discreet, in order to avoid drawing attention away from the site. The cave’s immediate landscape is spatially limited, and it would be easy to inadvertently change it. There was also the requirement to develop a prototype cultural heritage sign. The prime issue was simple yet problematic—how could such a surface be created without digging? One proposal in the early stages was to use large slabs of local stone placed at the level of the current grass-covered ground. This solution was well-adapted to the area, addressing the relationship to the cultural heritage site itself. However, it took just one field trip with the representatives from the disability organizations to demonstrate that this was unworkable. Similar solutions elsewhere had proved unsatisfactory, with users describing it as feeling like driving on a washboard. In addition, this problem would be exacerbated by frost heave. This early dialogue with the representative groups saved a lot of work on a potentially poor solution. A traditional gravel path would have been an eyesore and ruined the ‘Stone Age Experience’ for visitors. 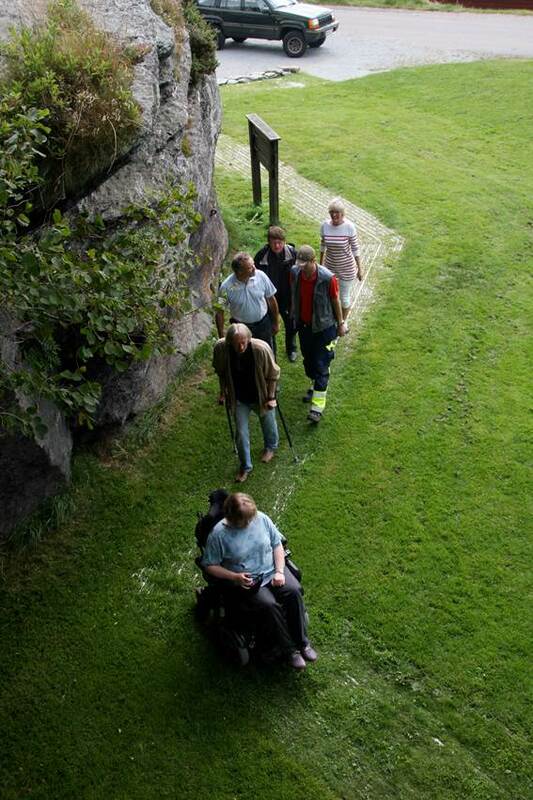 Such gravel paths are initially suitable for wheelchairs, but deteriorate as the grass grows inwards from the sides. This left us with so-called reinforced grass. This is traditionally made from concrete tiles with holes in them, through which the grass grows. However, this solution required digging 50 cm down to create a self-draining and frost-protected layer. This was not an option at Vistehola, and we were not immediately able to find any solutions to the challenge we faced. The solution for Vistehola Cave was previously untested and came into being as the result of cooperation with an innovative cross-disciplinary consultant. This consultant brought experience from major construction projects to the table, combined with knowledge and work experience from other heritage protection projects. The solution entailed reinforcing the grass by using aluminium grating, similar to the grating used offshore in fish farming and oil production. This grating is certified non-skid; the sections can be welded together, making it far less susceptible to frost heave than small concrete tiles, thus preserving an even surface. No drainage is required, and therefore no digging, unlike the other mentioned solutions. 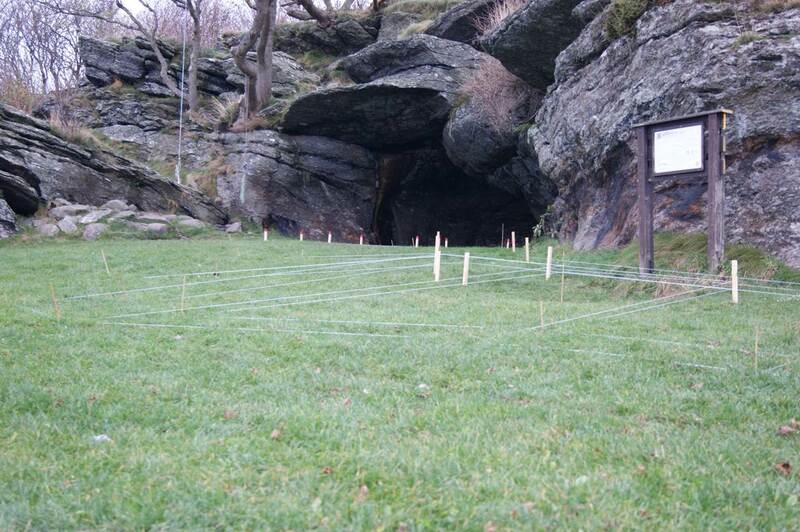 The grating could be placed level with the current ground at the cave entrance, only requiring removal of 5–7 cm of turf, thus avoiding damage to older layers. In order to achieve the desired gradient of descent for maximum accessibility, the path had to be raised by up to 50 cm from the parking lot to the cave. This required considerable landscaping to hide the build-up, in order to make it look like part of the landscape. It was acknowledged that the path width could not meet desired Universal Design requirements if wishing to avoid altering the main features of the landscape. 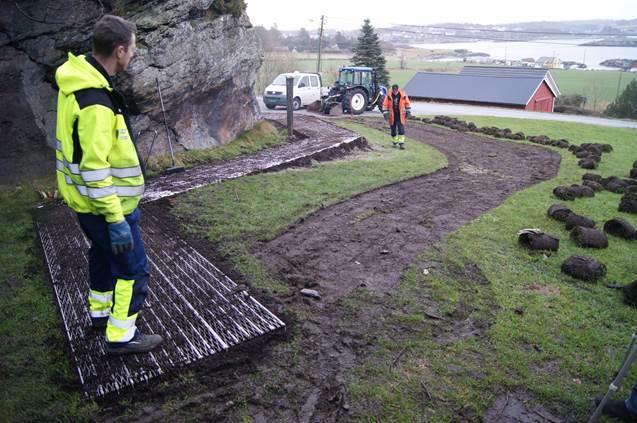 Increasing the width of the path from the 120 cm to 140 cm would have required landscaping an area two metres wider, significantly altering the local landscape (Rogaland County Authority 2015). 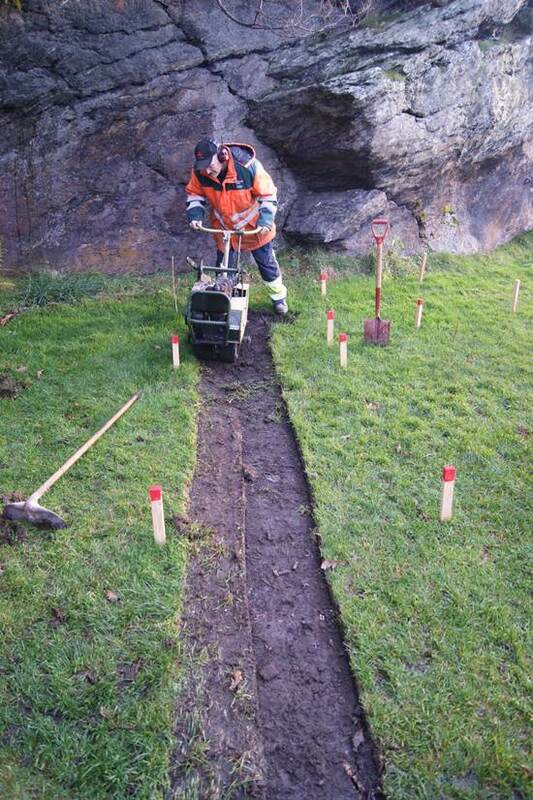 The landscape gardeners in Randaberg Municipality vouched that they could maintain this solution with lawnmowers without problems or significantly higher workloads. This sustainable solution reinforces the importance of early engagement with the maintenance crews, as their input on details throughout the process ensures trouble-free maintenance. In the case of Vistahola, maintenance staff were crucial to completing the construction phase. Without their contribution, the implemented measures could well have been financially unfeasible. Environmentally, the solution is fully reversible. Everything is covered with a fabric layer, without intruding into the layers below, and this can be removed at any time if a decision is made to remove it. The following pages show a number of photos from the cave before, during and after the Universal Design access project was put in place (See Figure 1 to 15). The project also included the development of a Universally Designed prototype sign, which included enhanced audio and tactile experiences, emphasising that the site was truly accessible and inclusive for all disabilities. The principle was to employ a 'common' attraction sign like the ones already in use (the top half can be seen in the photo below) as a template on which the Universal Design component is ‘latched on’ to (the lowest tile on the picture below). The Universal Design addition was given a tactile design, as well as an audio element with an MP3 player which can be accessed with an individual’s own earphones. By linking Universal Design principles to a conventional heritage sign, we achieved ease of use for sign designers, ensuring it will be used at other sites. The general qualities of the original sign are retained—this is no iconogram lacking visual qualities. The application of Universal Design simply enriches the traditional sign by allowing more people to gain knowledge of the site and take part in the experience. 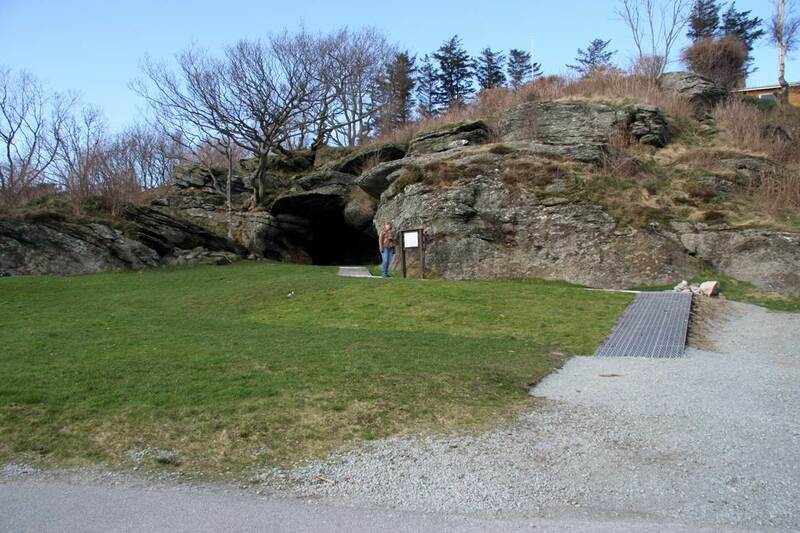 This sign also shows the cave entrance outline, the rock face and the ground beneath. Combined with the explanation given by the audio experience, this provides visitors with vision impairments with the opportunity to form an impression of the cave, its surroundings and size. In addition, the tactile experience describes the path network, enabling use of the path by people with vision impairments. Some development work remains for the technical audio solution, such as preparing the MP3 player for outdoor use in all weathers. This means that the sign is not fully compliant with the principles of Universal Design yet, but it will be. The tactile information chosen is combined with a physical, local audio source instead of a QR code, which, despite their many advantages, are not very well-suited for people with vision impairments, as was confirmed in dialog with the Norwegian Association of the Blind and Partially Sighted. The installation of a rest bench in the area was considered important for all visitors requiring a break, but especially for those who do not walk with ease. It would also enable quiet reflection and rest while viewing the cave from a distance. 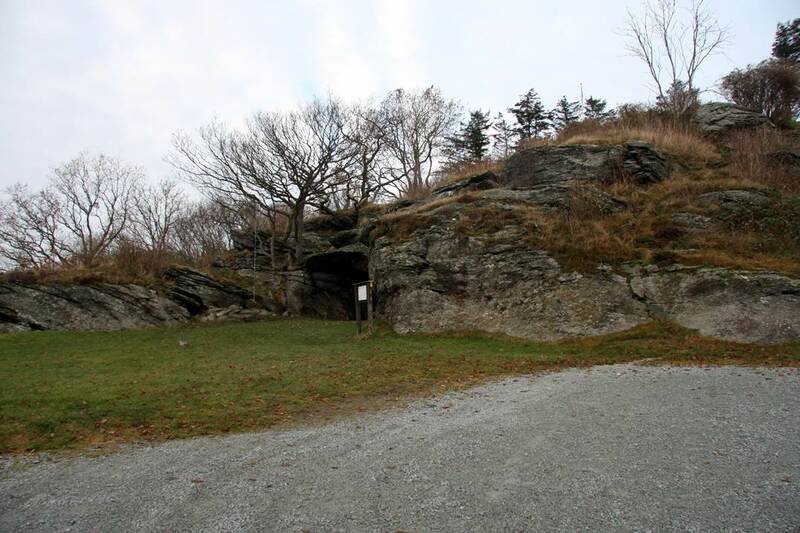 From the bench, both the cave and the landscape are visible, as they would have been during the Mesolithic and Neolithic periods, except that the sea-level was much higher then, and would have been much closer to the foundation of the bench. With such a dramatic environmental history to tell, a bench and table adhering strictly to Universal Design principles would not have blended in here, and another compromise was required. Our consultant wanted a robust bench, conjuring up associations with log canoes and the like—a Stone Age look, if you will. Wheelchairs can get next to the bench although cannot be wheeled beneath it. The bench is also wide enough to serve as a table. A lot of what a traditional bench-and-table solution would have provided is realised here. The bench is also heavy enough to make it impossible to move by children, securing it in place without the need for digging or casting foundations in this vulnerable area. There has been much to be learned from this project in a wide range of areas, including physical designs and methods. Some challenges remain in getting the audio experience in place, as well as minor path adjustments and grating connections. Each challenge has been approached with an innovative spirit and resolved accordingly. Much of this is due to the support received across the political spectrum for the framework provided by the County Plan, and of course from the financing provided by the Ministry of Climate and Environment and the County Authority. 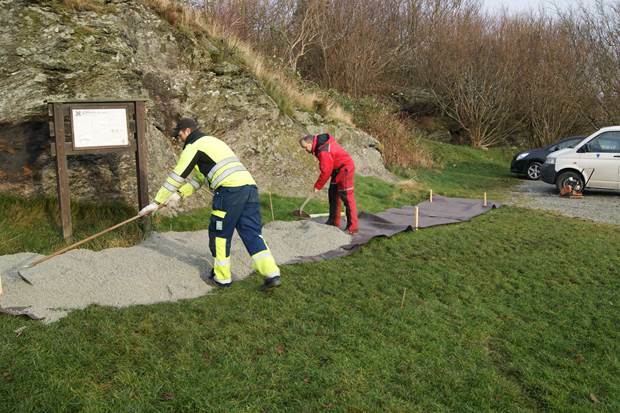 Close cooperation with the Parks Department in Randaberg Municipality resulted in enthusiastic user input from the earliest stages of the project. This was vital for the physical completion of the site and to ensure that any solutions could be easily maintained. The heritage protection authorities monitored the project closely, during both planning and execution. Their input encouraged a solution-oriented mentality, ensuring there was no compromising of the basic integrity of the site. Vital lessons were learnt from the project. The implementation of Universal Design in the heritage sector requires willingness to find good compromises that make the project feasible. Ideally, the consultant should have experience from, insight into and respect for both Universal Design and cultural heritage protection, in addition to formal training as an architect or construction engineer, ensuring cross-disciplinary expertise, to ensure sustainable solutions and compromises. Rogaland County Authority has not made any attempt at quantifying costs and benefits of Universal Design (Rogaland County Authority 2014). However, Norwegian public study report NOU 2005:8 contains an assessment of costs and benefits from the introduction of the ban on discrimination, mandatory general facilitation and mandatory universal design of buildings, facilities and outdoor areas intended for use by the public. The study’s starting point was that costs are unavoidable if the goal is to avoid discrimination. For new buildings and facilities, Universal Design means ensuring solutions that are necessary for some and good for everyone. This does not necessarily mean additional costs. Effective planning and execution can ensure good access with all its associated benefits. The costs of modifying existing buildings, facilities and infrastructure can be significant, but also provides numerous benefits, from improved quality of life, to improved quality and safety. Improved accessibility improves the living conditions of many, increasing their opportunity to participate in education, work, housing, services and recreation. In addition, there is the inherent value of inclusion and less discrimination. The findings of Peter Neumann’s survey, entitled “Economic Impulses of Accessible Tourism for All” (Neumann 2003) support those of the Open Doors Organization, indicating that removing physical barriers can enhance the tourism industry significantly. ENAT (European Network for Accessible Tourism) has published a marketing survey conducted by the Open Doors Organization in Chicago (ENAT 2015). The survey shows that, over the last two years, 26 million adults with disabilities have completed 73 million recreational and/or business trips, although even now, 25 years after the enactment of the Americans with Disabilities Act, considerable work remains to make air travel, hotels and restaurants universally accessible. It is important to remember this is not a small, niche market – a recent marketing survey shows that adults with disabilities spent USD 17.3 billion (ENAT 2015) per year in 2015, up from USD 13.6 billion in 2002. And as people with disabilities often travel with one or more other adults, the survey claims that the economic effect can be considered to be double that, i.e. USD 34.6 billion. There was the awareness throughout that this project was very much a pioneering one. The site’s success will be monitored, with further lessons expected to be learnt from the implementation of the scheme.